There is so much reward in growing your own food. There is even more reward (in my opinion) in doing it sustainability, keeping the bettering of the environment in your mind. Keeping the Miracle Grow and "icides" away from my garden is SO important to me. Soil building had become something over the last 20 years of gardening (I started early!) that I have been a sponge to. Tell me more I say. A few of the local soil "gurus" out there today are not difficult to come by. You just have to know what to look for. For one, if you have a local gardener who is forever "stealing" bags of leaves from the curbs in your neighbourhood, you can bet they are a soil builder. Leaves are a lovely, free way to protect and cover up bare soil over the winter. They act as a blanket, covering up the soil, and you can turn them under in the spring. Because I have raised gardens in the front yard, I have put a good 6-8 inch layer of leaves into our 4 plots for the winter. Our back yard has a HUGE pile encased in chicken wire that I collected this past fall (thanks neighbours! ), and I plan on babysitting the pile over the next 2-3 years until it produces a lovely, rich and nutrient soil for it's dear mommy to use in her gardens. I check on it when I am outside playing/working with SK, or adding to the black-bin that rests beside it. We juice almost every day, and I have been collecting the pulp from the juicer. I spoke with my worm-dealer, Bentley about what our wormies prefer... and he said that if I freeze the pulp before adding it to the composter, the fibers in the veggies even further break down, and it really fires-up the composter. 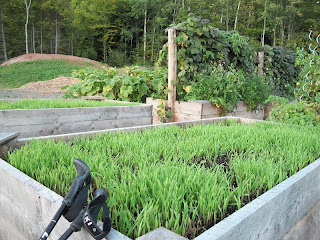 Getting back to soil building...another tell-take sign is a fall garden that is "covered" with a green manure. To the untrained eye, this may look like the gardener has thrown-in the gardening towel and given-up for the season.... but to the soil builder... they are covering up their precious soil to avoid erosion, weed over growth, unwelcome trampling-upon, and generally just being a good planner for the following spring. Green manure can be one of a few types of seeds. We have hard red winter wheat here that we thickly cast on the soil in the fall, and it was about 5 inches tall before the first snowfall. It looked like the image below before I covered up the beds with a THICK layer of leaves (see above). It will all get turned under soon. If you didn't plant a fall cover-crop, not to worry. Not all is lost. White clover or buckwheat is a fast-grower and can be used when the soil can be worked. Apparently buckwheat is hard to come by these days... (but I found some organic stuff at the bulk barn, and since my beds are small, I'm cool with spending the $7.00 to build up the soil.) Another gardening friend told me that rabbit food (basically dried alfalfa) is a good thing to use if you are short on time. Another alternative is alfalfa, buckwheat, white or red clover, or just generally letting nature take-over and run into your garden. If you are local to Niagara head over to the Minor Brother's Farm Supply store. Just be sure to purchase Organic, NON-GMO seeds... you wouldn't want all your hard work keeping those things at bay... to go to waste. Another alternative is looking online. I encourage you to shop locally, but if not possible, to all my fellow Canadians, buy Canadian seed. 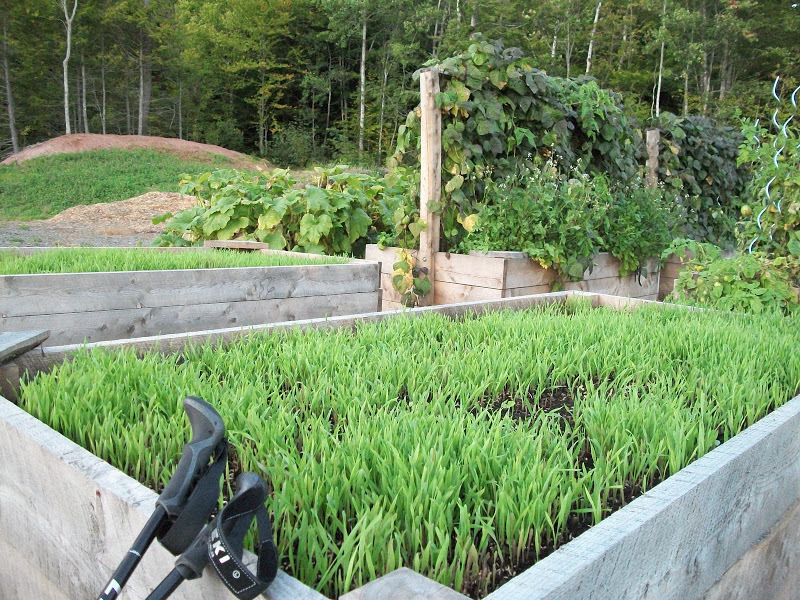 Here is an article from Dalhousie University about Organic Farms using green manure. Excellent resource.